Choies is an online retailer of affordable female fashion, based in China. They offer a comprehensive range of clothing, shoes and accessories, shipping worldwide. 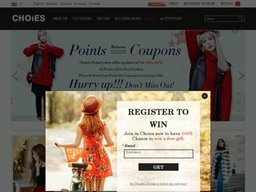 The online store which can be found at Choies.com was founded in 2006 by Chinese wholesalers who realized they could sell directly to western consumers online instead of supplying existing retailers with products. This allows them to offer a price close to wholesale. While no designer brands are stocked, all of the items are inspired by the current trends in fashion and look great regardless. As well as its inventory their are fashion blogs, galleries and information. Choies selection of female fashion apparel and items fall under the categories New Arrivals, Clothing, Shoes, Accessories, and Sale items. You can browse via these categories or use the search bar if you have something specific in mind. Clothing styles include Dresses (Maxis, Party Dresses, Backless, and more), Tops (Tees, Blouses, vests, and more), Rompers & Jumpsuits, Skirts, Pants, Knitwear, Coats, Jackets, Hoodies, Leggings, Skorts, Shorts, and Swimwear, and much more. Footwear includes Heels & Platforms, Flats, Sandals, Boots, Sneakers, and Casual shoes. Accessories feature items such as Jewelry, Bags, Belts, Scarves, Gloves, Hats, Sunglasses, Hosiery & Socks, and Hair Accessories like Extensions. Choies.com supports a wide variety of global payment methods including common debit and credit cards, such as Visa, Mastercard, Electron, JCB, Discover, and Diner's Club, as well as Paypal and Paypal Credit. Most products are eligible for free standard shipping and ship between 3-5 business days following 3-5 days of processing, from the original purchase date. In the case that you’d like to have your products delivered earlier, then you can opt for a different method by paying the flat fee. Express Shipping for example is $15. For a full shipping cost and timeframe breakdown you should add items to your bag and enter a delivery address. Customers can return items within 60 days of the original purchase date, as long as they go ahead and ask for a return authorization number, which will be provided by the customer support team of the site. Keep in mind that items which are not in their original condition will not be refunded.